In this tutorial, we are going to create a simple “polkadots” pattern, and use it with a brush to stroke the text, then, apply some simple layer Layer Styles to add the glow. Create a new 1024 x 768 px document, and fill the Background with the color #131313, then, create the text using the color #2695c4. The font used is Knuckle Down, and the Size is 250 px. 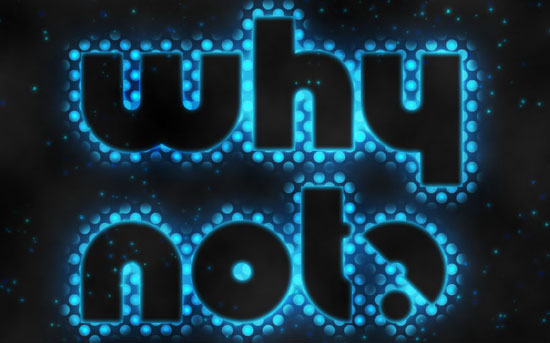 This will add the first layer of glow to the text. Another layer of glow will be added to the text. It’s time to create the Polkadots pattern. So open a new 32 x 32 px document, and go to View > Rulers, or simply press Ctrl/Cmd + R to show the Rulers. Make sure that the View > Snap option is checked (so the the Guides created will snap to the center of the document), then click the Ruler at the top of the document and drag a new Guide. While you’re dragging the Guide, it will snap to the center of the document when you’re near that point. When it does, leave the Guide there. Do the same for the Ruler to the left. Set the Foreground to Black. Pick the Ellipse Tool, and check the From Center box under the Shape Tool Options in the Options bar at the top. This will help create the circle form the center. Zoom in if you like, and place the cursor in the center of the document (where the two Guide lines meet), press and hold the Shift key (to create a perfect circle), and drag the shape outwards. The size should be close to the one shown below. You need to leave enough space in the corners of the document. If you draw a smaller circle, there will be more empty spaces between the circles in the pattern, (and less spaces if your circle is bigger). Right click the Shape layer, and choose Rasterize Layer. Pick the Rectangular Marquee Tool, and starting from the center of the document, draw a Rectangle that covers a quarter of the circle. Copy (Ctrl/Cmd + C) and Paste (Ctrl/Cmd + V) the selected part. It will be pasted in a new layer. Using the Move Tool, move the pasted part to the opposite corner. 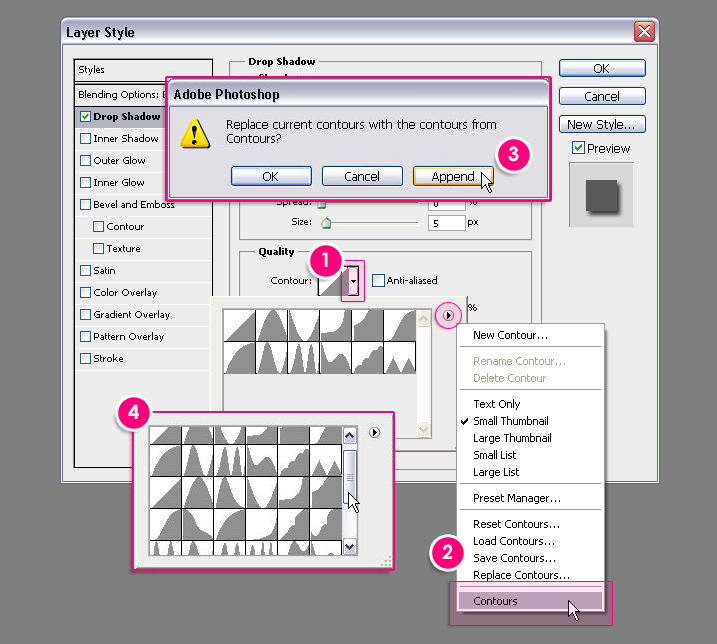 Repeat the same steps for the remaining corners, and make sure to re-select the original circle’s layer after each paste, as the parts are pasted in new layers, and you need to copy from the original one. Remove the eye icon next to the white Background so that the Background is Transparent. And that’s it for the Pattern! Next, we are going to create the brush. This is where we will use the polkadots pattern, make sure to check the Invert box, and to set the Mode to Multiply. Set the Foreground color to #2695c4, and grab the Direct Selection Tool. Create a new layer between the two text layers, and call it Polka Dots. Ctrl/Cmd + click a text layer’s thumbnail to create a selection. Make sure that the Polka Dots layer is selected, and press Delete to get rid of the inner parts of the Stroke. This will add a very nice glow in the center of the polkadots. Set the Foreground and Background colors back to Black and White, and create a new layer on top of all layers and call it Clouds. Change the Clouds layer’s Blend Mode to Overlay. This will add some nice variations to the glow intensity in the Stroke. The following steps are optional. We are going to add some nice blurry sparkles around the text to give a space-like feel. You can increase the Spacing value if you want more space between the sparkles. Create a new layer right below the Clouds layer, and call it Sparkles. Set the Foreground color to #0669b2 and the Background color to #00f4fd. 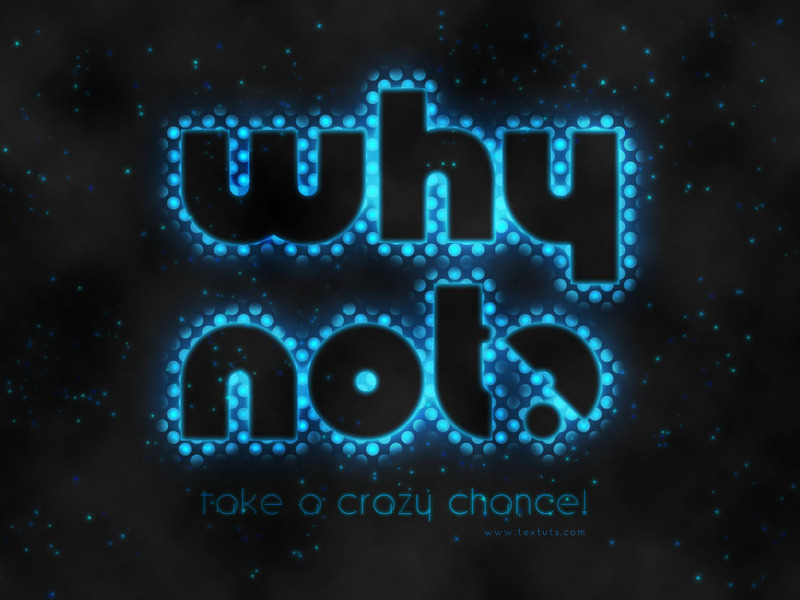 Start adding some sparkles around the text. Duplicate the Sparkles layer, and change the copy’s Blend Mode to Linear Light. Select the Sparkles layer once again, and go to Filter > Blur > Gaussian Blur. Change the Raduis value to 3. The blur will give the sparkles a nice glow. hey mate, very nice tut, i really appreciate it. I really like the colors you chose, and the result looks definitely awesome. Just a simple note though. I noticed that the polkadots glow is emitting from the edges, not from the center, so I guess you didn’t change the Source to Center for the Inner Glow in Step 5. But other than that, great job indeed! Glad you enjoyed the tutorial. Thanks a lot for the comment and the link. ahhhh, i do see that now, but i still enjoy it anyways. No problem at all, I still think your result is great as well, just thought I’d point that out. You can get the Contours you don’t have by following the steps shown in this image, but it’s good that you created the contour by yourself! You need to replace the dark background created in the first step with the photo, but I’m not sure how that will work out, as the effect is based on a dark background. So if your photo is dark, it might look good, if not, then the glow might either disappear or be so shiny! I don’t have it :d !!! Hey amazing tut, but i have a problem, when i got to Setp 5 i right clicked on the text layer but there is no option for ” create a work path” please help me am new to photoshop. As for the “Create Work Path” option, is it grayed out or does it not exist at all? You might be clicking on the layer’s thumbnail (icon), but you need to click on the layer itself. Hope this helps, but if the problem still exists, please feel free to add a reply. Amazing and outstanding results. Instruction is really clear and helpful. Thanks a lot for the comment, I really appreciate it. I am doing the same as in the tut.. but on 5 step there is no ” create work path ” option available for me….actually it does not exist at all..what should i do now ? please help me out of this … i also want to make a logo like the same..
What Photoshop version are you using? Are you right clicking the text layer and not its thumbnail? I’m guessing you might be right clicking the thumbnail, so please try to right click the empty area to the right and see if you can get the option. Hope this helps. Please feel free to attach a screenshot of the issue if the issue still exists.